Inveneo is a proud 2011 Laureate of IDG’s Computerworld Honors Program for its submission: “Haiti — Broadband for Earthquake Relief and Haiti’s Future”. Computerworld Honors is the longest running global program that recognizes individuals and organizations using information technology to promote positive social, economic and educational change. 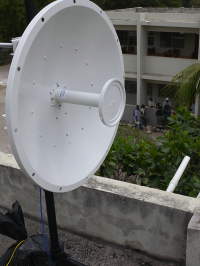 Inveneo was nominated for our role in using broadband Internet for earthquake relief and Haiti’s long-term rebuilding. Kristin Peterson, CEO and Co-Founder, will accept the award on behalf of Inveneo at the Annual Laureates Medal Ceremony & Gala Awards on June 20th at the Andrew W. Mellon Auditorium in Washington, D.C. At that ceremony, five laureates in each of the eleven categories will be named as finalists for a 21st Century Achievement Award, based on judging by an exclusive panel of peers. One finalist in each category will then be named a 21st Century Achievement Award winner. Wish Kristin & Inveneo good luck in being chosen! By networking its primary clinic locations and outfitting them with workstations linked to the central OpenMRS server in Eldoret, AMPATH can transform the way it provides medical care. A high- speed network linking the clinics allows Eldoret-based doctors and specialists to ‘whisper in the ears’ of field clinicians, nurses, and health workers as they meet with patents, helping with diagnosis and treatment in real or near-real time. The creation of an AMPATH network opens the door for providing a number of additional computerized services to field locations including VOIP phone calls and centralized email. Inveneo designed and deployed the network in Eldoret, working with local partners Setright and technology partners. The deployment was also used to train these partners in low cost wireless solutions. Our partners are now providing network support. BOSCO focuses on providing innovative information and communication technology (ICT) solutions using a collaborative and Internet approach to foster socio-economic development and peace building in rural communities in Northern Uganda.